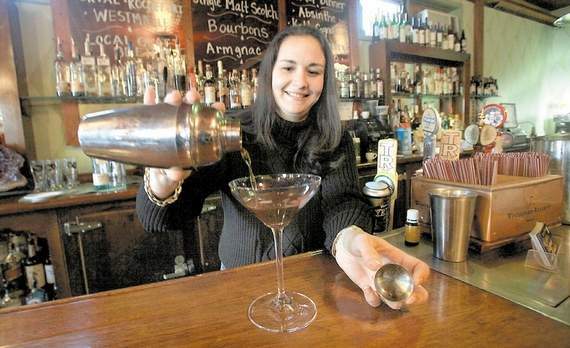 Jamie Gulliano prepares one of her w/ specialty drinks at Aroma Thyme Bistro in Ellenville. 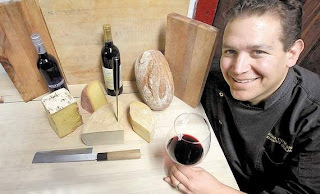 Chef Marcus Guiliano with a display of organic wines and cheeses at Aroma Thyme. Marcus Guiliano has always been organic-minded, but he really started paying attention to organic foods about 10 years ago. He was on five different medications, was overweight, had chronic acne, chronic fatigue, high blood pressure, high cholesterol, was asthmatic his entire life and had acid reflux so bad his doctors wanted to operate. "I reversed everything and dropped every single medication I was on, all through diet," Guiliano said. "I started eating more organic, more healthy, more unrefined foods. I'm 37 and have been a chef since I've been 19. Half of my career has been killing myself (laughs) and the other half has been revitalizing myself. I was killing myself with my fork." Guiliano grew up in Ellenville and learned how to cook at the formal apprenticeship program at the Greenbrier Resort in West Virginia. lost his job as an executive chef at a country club in Westchester County. He and Jamie opened the Aroma Thyme Bistro on Canal Street in Ellenville in 2003. 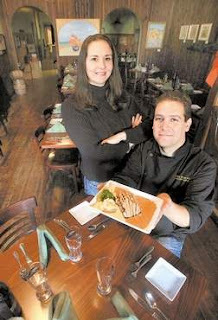 It's the readers' choice for Best Organic-options Restaurant in the Hudson Valley. Guiliano is the first to admit that the bistro is not 100 percent organic, but he likes to use and focus on organic foods. "We do the best we can. There are certain things that I'm very strict on when it comes to organic and certain things that I'll let slide," Guiliano said. An example of his strict nature is with the handling of crops from certain areas of the world. "Anything from South America and Mexico has to be more organic (for us to accept it) because they use DDT." DDT is an insecticide that is toxic to animals and humans and has been banned in the United States since 1972. "We're no longer allowed to use DDT in America, but we're the largest producer and we're the largest consumer," Guiliano said. "It gets shipped to all these other nations and they spray it on their crops and those crops get shipped right back to us with DDT on them. Sometimes, based on where the food is coming from, I'll refuse to buy it." He said that the bistro has become more of a destination restaurant and that business was up by 12 percent in 2010. Guiliano cited two reasons: a weekly, in-depth training session with his staff on product knowledge, and simply, more people are realizing what they're eating. "People are now searching out restaurants with pure food and they'll drive out of their way for it," Guiliano said. "When people come to this restaurant, they get an education. The more you educate your customers, the more loyal customers you get."